Me doing the CCIE Data Center lab exam … CCIE Video track? 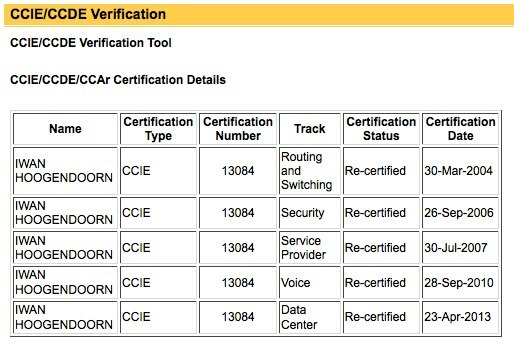 Just wanted to update you trough this post that my journey in achieving the CCIE Certificate just came to an end today. When Cisco announced the CCIE Data Center track in March 2012 I immediately knew that this was going to be one of my goals. As this list above is just a guideline, there may me other resources out there that you may find better, and that are actually better. People in the field will ask me, how I started, what my approach was, etc. etc. I personally felt that the exam was difficult, very difficult, it really took a lot of effort and I gave everything that I had to finish it. When I left the exam I was not happy because I experienced some issues that I was not able to solve. It took me so much effort that it felt that my head was going to explode when I the time was over. I really gave everything that I had in me. Back home I wanted to do nothing else then just watch TV with my wife. The above is based on my personal opinion so other may think it was easy 🙂 but I think otherwise. Congrats Iwan, this is great! First to achive the CCIE Data Center. It’s awesome. Gratz i hope i can achieve my R&S soon. Congratulation!! That’s pretty extraordinary feat having 5x CCIE. Any advice for the beginner folks who are trying just attain their first? Hi Iwan, Gefeliciteerd man!! Ik las ergens in de VS dat je het had gehaald. Veel success met de 6e? congrats. inspiring to read about all this.